Casio Classic F-91WC-4AEF to modny zegarek uniwersalny. Zegarek wyposażony jest, między innymi, w chronograf (stoper) i funkcję daty oraz alarm (budzik). Materiał, z którego wykonana jest koperta to plastik/kauczuk natomiast tarcza jest wyposażona w wyświetlacz LCD. Ten model został oznaczony jako wodoodporny - może wytrzymać lekkie zachlapania lub deszcz, jednak nie powinien być zanurzany. Zegarek jest wysyłany z 2-letnią grawancją i oryginalnym opakowaniem od producenta. Product arrived quickly and its as expected. 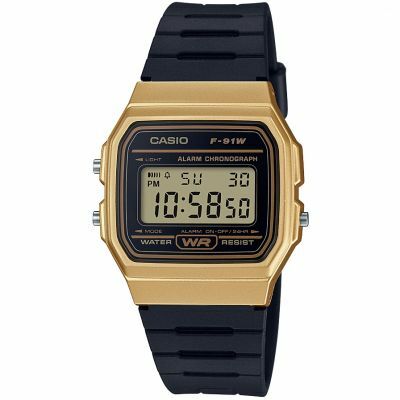 I have a similar Casio model but the pink version was a stocking filler for my wife. 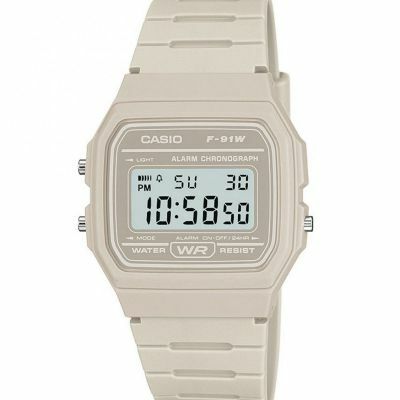 Its a classic Casio which is probably the cheapest and best watch you can ever own. Excellent product and service. Highly recommend this company. Absolutely brilliant. It is light and small. I love the colour. I use the stop watch quite a lot and it is really easy to use. I get it sweaty by doing lots of exercise including long distance running and it works really well. The only down side is that the stop watch only runs for 1 hour and then re sets itself but its no trouble really. A great product. I love the colour and it is really simple and effective. 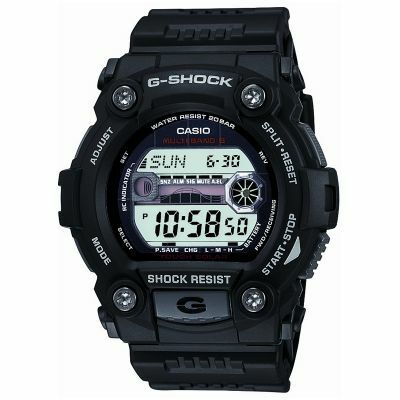 Wife loves this watch...its a fun, colourful, comfortable alternative to wearing an automatic dress watch all the time and she has already purchased a Casio G-shock off the strength of this Casio. Lovely bright pink watch. Easy to set up. Good value. Excellent. Pink. Tells the time. Fits on wrist. These little watches are great - so versatile and good value for money. A must-wear for sports-lovers. only problem is the pink strap goes black very quick and i was not able to clean it. ive tried almost every method there is. Excellent! My daughter loves the pink watch so much. Really good for value! Needed a rubber watch for work and this is great dose what I need it to do! Also love the colour! The size is just right too! Great watch, cheap but shows the day, date and time which is perfect for my job. Pretty in pink too! Watch was delivered safely and well packed and speedily. Was as appeared on the photos and was apparently in good condition. As this was a gift it has not yet been taken from its wrapping and tested but hoping there are no problems. For me this watch is not 100% what I wanted but I guess buying on line it is difficult to accurately assess items. I would have preferred larger, clearer numbers, particularly in the stop watch mode perhaps a mans watch would be better although this is classed as unisex. Although I do not have slim wrists, I find it twists to the side of my wrist unless I do it up quite tight. But the pink is fun and it does for an everyday watch. Great colour pink and great value for money. I wanted a durable watch to wear everyday that wouldnt stop working if caught in showers. The watch is exactly what I wanted. Its very comfortable, has a stopwatch, alarm, 12hr/24hr option and a light. Love the design. 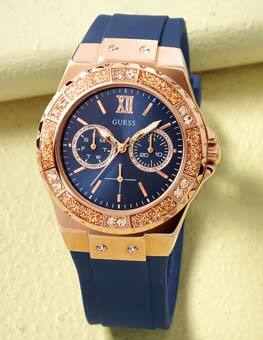 Absoloutly pretty watch.excellent colour.will buy again in diffrent colours and so light to wear. Good watch, needed stop watch facility for my exams so very usual. Love the colour. Only problem is my wrist is between sizes of the holes, one hole is too big but the nieghbouring hole is too small. If the gaps between the holes were a tiny bit smaller it would be better. 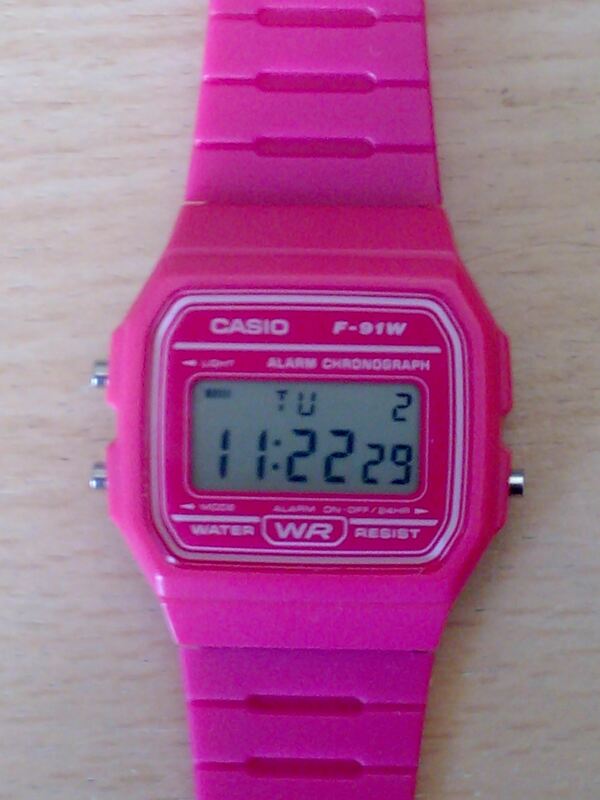 Got a bright pink casio, great colour, perfect for messing around as the rubber looks duarable! Lovely watch, nice packaging! Cheaper than anywhere else! Arrived next day!! So happy with this watch the colour is so sharp, it looks so retro. Features wise it is perfect I bought this watch for work and its exactly what I wanted. This was purchased for my wife to use in her preparations for the Race for Life Muddy Challenge. It is easy to use, has a good strap length and being plastic makes it ideal for any weather. The Pink colour is quite fitting with the Pink Ladies team and RfL colour schemes. Thank you very much! Would recommend again! Such quick delivery and exactly as it says on the description.. Very happy! Bought this watch for my daughter for school and she loves it. Great value and very practice? I love this. Its the right size face for my wrist which is very small. Im allergic to most watch straps but luckily this one is fine so I will be getting every color. Very trendy!! Great watch, my daughter loves it! Fantastic, quick service with next day delivery! Excellent - a brilliant watch that I have worn for many years. Reliable and sturdy, looks great too! Comes in a presentation box so good for a present. good solid watch, good quality. colour not quite what was shown in the picture, slightly less bright. search in google images for more accurate colour, still very nice though! easy to see time. Colour is just as photograph. Even thou its made out of plastic, it doesnt look or feel cheap at all. 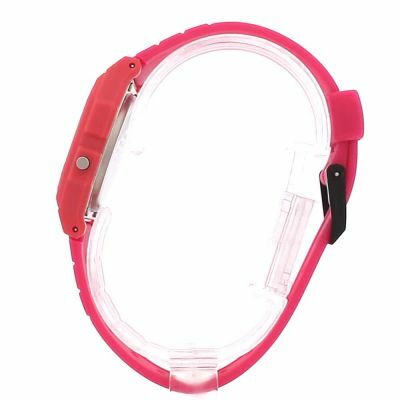 Also it is very light and stays firmly on your wrist, without slipping down. Great product! Good fit and colour and size. Has stopwatch - I bought it for running. Does the job. Nice feel to this watch. I have it for my out of work casual wear and seems to be doing the job just fine. Good value for money so far. My 10 year old daughter was very pleased with this. She quickly sussed out how to use it and was happy with the bright pink colour. I just hope that she does not lose this one!! Brilliant little girls watch, my 5 years old daughter wears it all the time although a little loose! 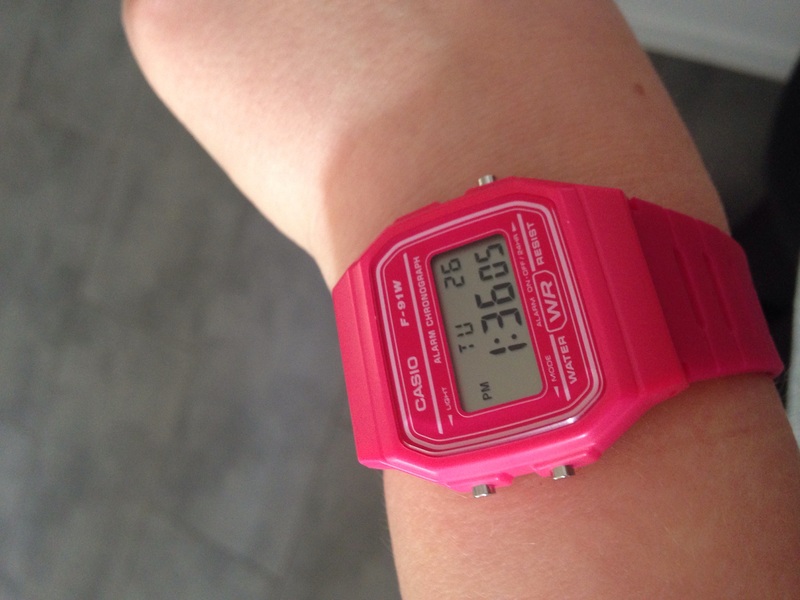 I recieved my Cassio pink watch very quickly after order, its comfortable to wear, great bright colour, lightweight, its features are easy to use and the watch comes with good packaging and instructions. It has a light feature so you can read it in the dark and any age could wear this. 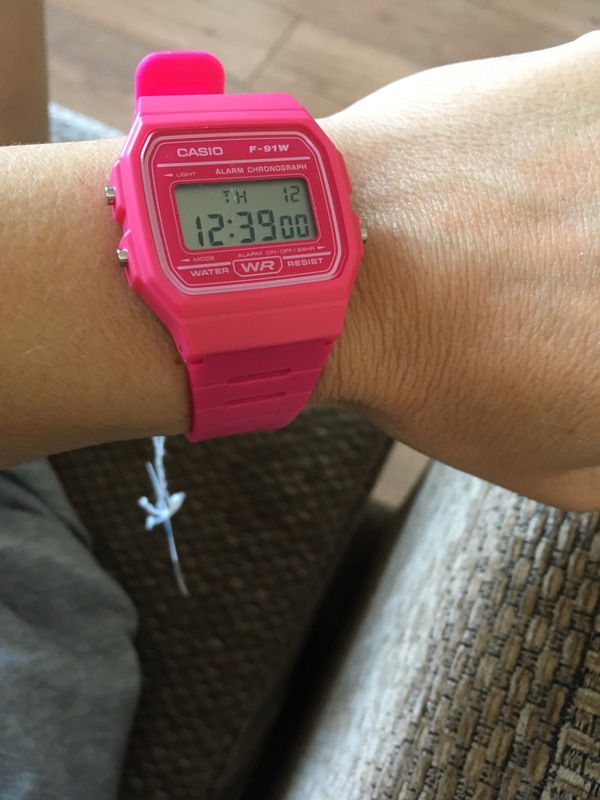 This Casio watch has been a big success with my daughter - its funky and smart but seems well constructed as youd expect from Casio- much better than a similar but unbranded watch we bought previously in which we found that the battery was not replaceable! This Casio has a nice stainless steel back with proper screws. The display is clear and has a useful backlight, as well as the usual digital functions. 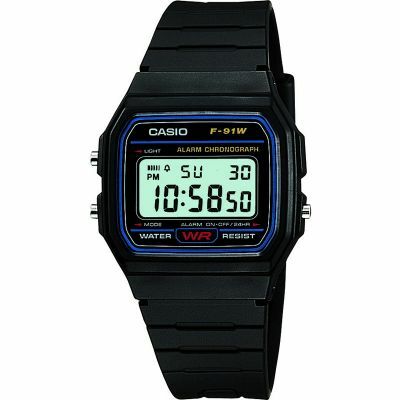 Bought this watch to wear for work as I wanted one thats easy to use, shows the time clearly & can light up in the dark. I am not disappointed! So easy to use & perfectly clear screen. The colour is the same as the picture. Ive got really small childlike wrists & this watch fits perfectly & does not look too big on my arm. Great modern looking watch.Very pleased with look and features also the price managable for everyone.the service and speed from watchshop was second to none Great present for my neice sure she ll be delighted. My daughters been on about this watch for ages and as its nearly her 21st birthday I thought Id buy it as a gift for her. The screen is clear and the colour just right. Hopefully shell like it. Good colour as advertised and priced just right. Super fast delivery, great service, many thanks. The watch is perfect. The colour is such a pretty pink. The strap is lovely and soft and because it has a buckle its a perfect fit. I would definitely recommend this watch and website. Next day delivery was excellent. Very pleased with this vibrant watch. The colour is a more vibrant pink to the picture but for me that was a plus as it looks like a baby pink in the picture. The plastic strap is very comfortable and fits even stupidly thin wrists like mine. Its also very easy to work and set the time and date etc. Bold colour, does exactly what it says on the tin. Slightly smaller than I thought. Not hugely robust, but it is a cheap watch so it would be unfair to expect the same feeling as more expensive items. Very happy with it and would purchase again. 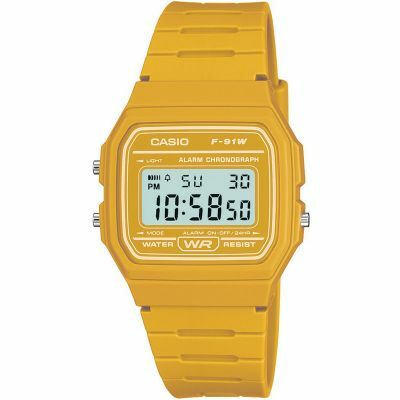 Bought this retro style digital watch for my daughters birthday. She was delighted as it was exactly what she wanted. Nice stlye watch and lovey shade of pink. Came with full instructions, guarantee and box. Great value watch, well made, serves the purpose well and is really functional and easy to use. Yes it doesnt have loads of features, but it doesnt need to, and you know that when you buy it. Great colour too. Great watch, not what I expected for the colour but was pleasantly surprised! More of a vivid pink. For the price it is very reasonable for its style and functions. 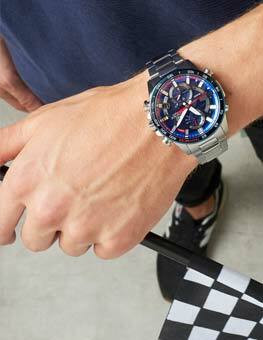 I was searching for a watch like this for a while, but most watches I saw where crazy expensive. This one had the perfect price, and on top of that the perfect colour! Product is better then expected. Colour is really vibrant and goes with classic look of watch. Really easy to use and set. Would definitely recommend this product-as much for look as well as practicality. Really love my new watch. It is very comfortable and I wear it everyday. I love the colour of the watch as it stands out and is very noticeable. 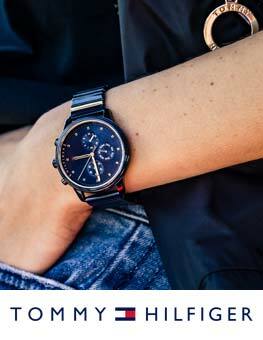 If you want a nice casual and sporty watch then this is definitely the one for you. This watch is a bargain! Loved my watch! Beautiful colour and exactly as described. Was very happy with it! Nice and sporty and perfect for everyday purposes. Product exactly as described on the website. The watch is really good quality and very quick delivery. Defintiely recommended! Brilliant little watch! Lovely colour. I'd recommend to anyone that wants a little everyday watch! 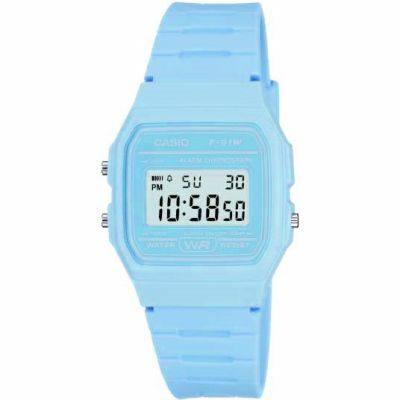 It was for a gift, my sister loved it : the colour, the design, the high quality from Casio : what else does she need ? excellent service, very quick with delivery. watch is perfect, would use this company again. Beautiful watch. Very impressed. 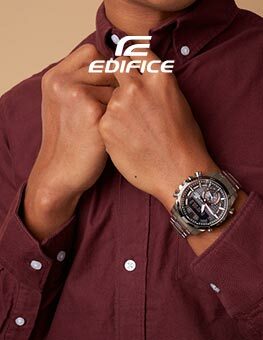 Beautiful colour, I like the black belt buckle, the light weight, the durability and the multi-functionning of it. The watch has arrived very fast and in very good condition. Watchshop.com was an excellent shop. Thank you. Great watch. I was expecting for the coloured F91 and I liked it very much.